With the cold weather this winter, there’s nothing more comfortable than radiant heating, especially when it’s installed in your flooring or used for high-end treats like heated towel racks. However, if you’ve used a product known as Kitec in the installation of the radiant heat, some insurance companies won’t insure your home. This issue turned up in a house inspection recently and caught everyone by surprise. Is this the new UFFI? It seems that the plumbers who originally installed Kitec have come to believe that if you have Kitec in your home, it will eventually cause a problem, not maybe but definitely. If you have radiant heating in your house that is water heated and was installed between 1995 and 2007, call your plumber and have him or her certify that no Kitec was used. If you do find Kitec, the best thing you can do is replace it right away and join in the class action lawsuit at http://www.kitecsettlement.com to get some money to help the remediation. Sold between 1995 and 2007, Kitec is a piping system that was used both for carrying water throughout a home and supplying water to radiant heating systems. The Kitec system used brass fittings as well as blue and orange flexible piping, which was made from a mixture of polyurethane and aluminum. This system was initially thought to be a superior product to copper piping because the Kitec pipes are more flexible, easier to install, and less expensive than copper. In fact, many plumbers pushed for the use of Kitec over copper piping before it became apparent that the product was faulty. Kitec was manufactured by the IPEX company, and has also been sold under a variety of other brand names including IPEX, PEX, AQUA, XPA, WARMRITE, Kitec XPA, AmbioComfort, Kerr Controls, and Plomberie Améliorée. 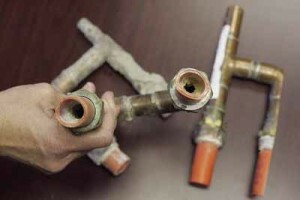 This is not the first time the IPEX company has come under fire for faulty products; in 1995, they recalled their brass compression fittings in both Canada and the US after it was discovered that the fittings reacted negatively with pipes, causing them to corrode and fail. Even if you haven’t been denied home insurance because of the product, you should still be able to receive compensation from IPEX in order to help you replace the Kitec. In 2011, three class action lawsuits – one in the US, one in Québec, and one covering the rest of Canada – were brought against IPEX on behalf on anyone who owns or had previously owned a home with Kitec in it. In 2012, all parties reached a settlement in which IPEX was forced to create a settlement account of US$125 million in order to compensate the claimants. The settlement became effective as of January 9, 2012, and the deadline for filing a claim against IPEX is January 9, 2020, so if you believe you deserve compensation, be sure to visit http://www.kitecsettlement.com to see if you are eligible and to find out how to make a claim.